After removing the screws on the bottom of the projector, the top half of the shell easily comes off to reveal the internals. As predicted, the device contains an LED, some optics, and a small LCD for the light to pass through. It does seem like there’s a lot of wasted space inside the enclosure, but overall, the internals are exactly what you’d expect considering we’re looking at what’s essentially an LCD projector built to the lowest price possible. One interesting note here is that the enclosure has a sealed shut battery compartment. It would seem that at some point the designers thought of allowing the user to run the projector off of standard AA batteries, but this feature was likely deleted due to what was certainly a very short runtime. Though one does wonder what advantage a battery powered holiday projector would even hold, given the fact that it would never need to be moved to begin with. Despite being such a simple layout, the design of the AppLights projector is not without its flaws. As you perhaps noticed in the previous image, the cooling system for the device seems to be of a notably poor design. Apparently what little air from the 60 mm fan that’s able to blow around the sides of the power supply is all that’s expected to cool the LED. To make matters worse, what appears to be a fan “grille” built into the case is in fact solid. Beyond two tiny holes, there’s no inlet for cool air to enter the device. Note the fan wires pinched during assembly. While you could argue that the ambient temperature this device is expected to operate in means that a robust cooling system might not be necessary, it’s hard to imagine how this arrangement is expected to do much of anything. If this device fails down the line, it seems almost a certainty it will be due to cooking itself. While digging deeper into the projector, I was surprised to find that the small power supply tucked between the cooling fan and the LED heatsink seemed to be…not terrible. It’s a separate removable module complete with its own plastic case, appears reasonably well constructed, has a fuse on the AC side, and unlike the power supplies in other cheap gadgets we’ve dissected, it’s actually mains isolated. It even includes the aforementioned fan. When connected to an adjustable load, we see the power supply is capable of delivering 1.35 A at 18 VDC before the voltage starts to fluctuate and the fan slows down. With the AC side already pre-wired for you, this little module could be an excellent basis for a light duty bench power supply when paired with one of the popular DPS modules we’ve covered previously. Before I even opened the AppLights projector, the LED itself was probably the part I thought would be the most interesting and potentially reusable element of this product. 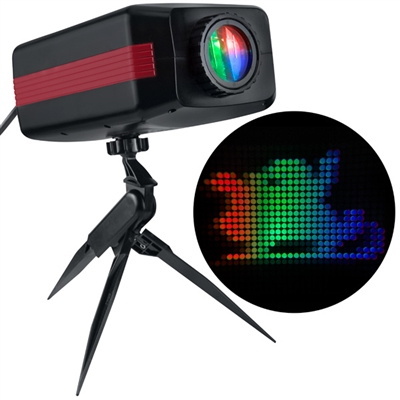 Even if nothing else in the projector was worth keeping, a high-output RGB LED and associated lens would be useful for all sorts of lighting projects. I’m happy to report this component is ripe for the harvest. The rear of the 20×20 mm module is marked “LY18423”, though that didn’t seem to return any useful information when searching. But after browsing AliExpress and comparing images, I’m fairly confident this is a 10W module. It’s wired with some very nice color coded silicone wires that have heat shrink tubing on the ends, and there was even properly applied thermal compound between it and the heatsink. At the very least, this part of the device was relatively well done. 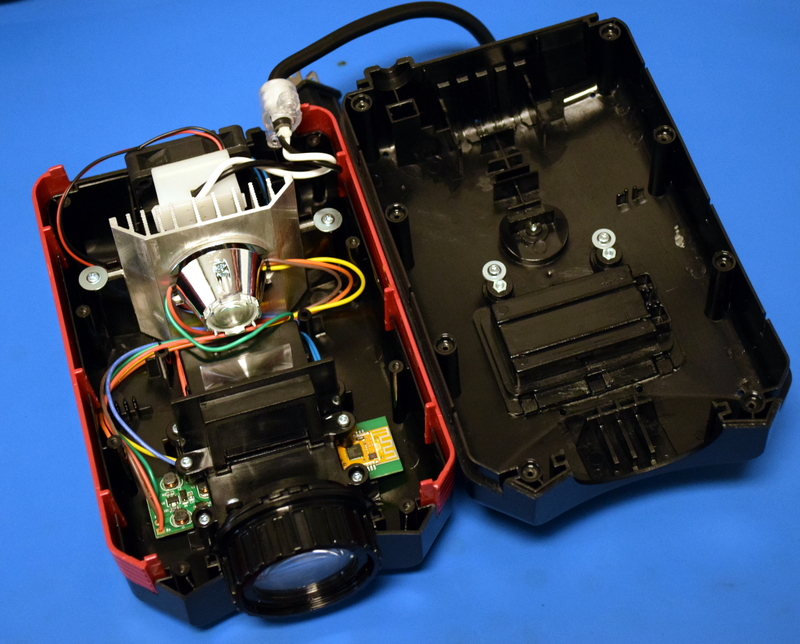 All of the electronics for the AppLights projector are held on a single PCB, which is logically laid out in sections that contain the three LED drivers, the LCD controller, and the Bluetooth module. Unfortunately, the LCD controller is covered under a diabolical black epoxy blob, so those components are something of a mystery. Interestingly, at the top center of the PCB we can see pads marked “- BAT +”; confirming the theory that at one time this device was meant to run on batteries. Must have been a sale on larger ZIF connectors. The traces can easily be matched with the datasheet. It was refreshing to see that not only had the markings on the Bluetooth module not been obscured, but that searching for the number actually resulted in finding a datasheet through the FCC ID database. With the pinout in hand, we can see from the traces that the TTC2541 module appears to be communicating with the black blob over I2C. This fact was confirmed by connecting a logic analyzer and selecting different options in the smartphone application. Originally I had hoped this teardown would end in the AppLights projector beaming out an image of our beloved Wrencher, but upon examination with the logic analyzer it appears that the collection of images and animations offered in the smartphone application are burned into the LCD controller, and the Bluetooth module is simply passing along the ID of what the user wants to show. Getting the projector to show anything other than what’s already in its repertoire would likely mean taking over control of the LCD manually. That would be easy enough, but at this point I should probably mention the resolution of the projector is abysmal. The LCD panel is only 32×24, and each “pixel” is a dot approximately 0.5 mm in diameter. In practice this means the projector can only show three text characters at time. Anything longer than that, and it will scroll them across the screen. (The scroll speed can be set in software, at least.) I’m sure there are talented pixel artists out there who could make something cool with 32×24 fat dots, but I’m certainly not one of them. These teardowns are never meant to be a review of the product, per se. That being said, I did play around with the “AppLights Personalized Projection” enough to confidently say that as a product it’s rather poor. The smartphone application (which is required, incidentally) is a mess, and the rudimentary images are dim and projected only a short distance. If you’re interested in it as an actual holiday decoration, I certainly wouldn’t recommend it. But in terms of the hardware, it contains a very nice AC/DC power supply, a powerful LED that should be easily grafted into a different project, and even a fairly well documented TTC2541 BLE module. The LCD and its epoxy blob controller are something of a disappointment, but given the low resolution, I’m not sure what it could really be used for anyway. All told, I would say this is another good example of the useful hardware that the industrious hacker can find in the clearance rack for pennies on the dollar. Sure you could source the individual components for less than the clearance price of the projector, but you’d still have to wait the weeks for them to ship to you. But more to the point, taking these things apart to discover new components is half the fun. Consider it a late Christmas gift. ← Ask Hackaday: Can We Get Someone To Buy And Destroy RAM? How many of us have power outlets at the ends of our driveways? You want to get this out away from the front of your house so you can shine it back at it right? I use an extension cord run across my walkway with a mat over it to prevent tripping but I’m not really a fan of doing that. Batteries, IF they could get a decent runtime would be a welcome improvement! I usually put my holiday in my Jeep as that is more of a weekend play vehicle that doesn’t get moved daily. That way it’s out of the elements. It has to shine through the tinted windows though so the display on the wall is dimmer than I would like. I’m still thinking about better solutions. If I do keep it in the Jeep for future seasons I might consider plugging it into the vehicle’s battery. First I need to get a solar panel for the roof of the car though otherwise I’d just be running that same extension cord to keep the car battery charged! Don’t run it off the car battery. Lead acid batteries don’t like being deep-cycled unless they’re designed for it, and car batteries aren’t designed for it. They’re optimized for starting current. Run an extension cord out to the jeep. Arctic rated cable buried a mere 100mm below the grass edge where it meets the concrete. Insert spade, pull back sod, insert cable, replace sod, rememeber the cable is there. Fit IP66 socket outlet on a stake at bottom of drive. Terminate cable other end in a plug with on/off switch. Totally not to code, total cost £25. Done to code, probably cost £250 for parts plus £250 for sparky for the paperwork. Will kill cats, neighbours, small children etc. Like like the outdoor sink (stainless, ikea recduced section, £15) I fitted round the back of the house which is also not to code but mightly useful for shoe dog poo removal. I wonder if you could substitute one of those 128×128 Nokia color LCDs with the backlight removed? With some additional light isolation and perhaps a better lens, you could make a real projector that does something half decent for inside use. Re: Thermal Mismanagement. – that’s awesome! I have worked with mechanical engineers and managers who thought all you need to do is put a heatsink on the hot parts. I spent a lot of time trying to get them to understand that the heatsink only works if it has a lower temperature to transfer the heat to. Some eventually got it, some didn’t. Fans confuse the heck out of them too. In which I run to Amazon, finding out those must have been some expensive, myths, mistakes, and lessons, because it’ll take $44.00 a book to recover from the pain. Funnily enough I’m skeptical of the Price to info ratio of the book linked above so I went in search of a free copy to “try before buy” so to speak…. That’s a great hardware dissection, but it’s still snowing here, if someone wants to keep celebrating Christmas, more power to them! At the current rate in my area, Christmas spirit will be on display at my house until july. Hopefully by then the light strings will have thawed enough to where I can remove them. Around here the term “icicle lights” is pretty literal. I leave mine up year ’round, (power off in early January) but this summer I need to find the time to tighten them up. The wires have developed a noticeable sag over the years. Maybe the batteries were meant to be rechargeable via a solar panel. Wireless decorations. That would sell like hot cakes whether it worked well or not. Would be interesting to see if this gadget comes back around next year with an option like that. That watch crystal up at the top of the PCB also hints to some kind of timer functionality, which doesn’t seem to be in the current software. Solar panels and a software setting for it to only run for X number of hours a day could be interesting. Was there a jtag ish looking port for the blob? They use this same enclosure for a countdown to Christmas timer. The batteries backup the time when power is off. Considering the PCB has pads for the battery and a watch crystal on it, I’m guessing they also share (mostly) the same electronics as well. Gemmy is an American company that’s been in the holiday decoration business for a long time. I really wanted to get my hands on some of the “Try Me” display boxes from WalMart after Christmas 2018 but nobody would tell me if they just tossed them and their yummy video screens or if they would be sent back to the company. I contacted the company and whomever replied claimed to not know anything about them. Through in a I2C 1602 LCD and you have a projection clock. Which logic analyzer software is this? Is this Sigrok with one of its nice decoders?